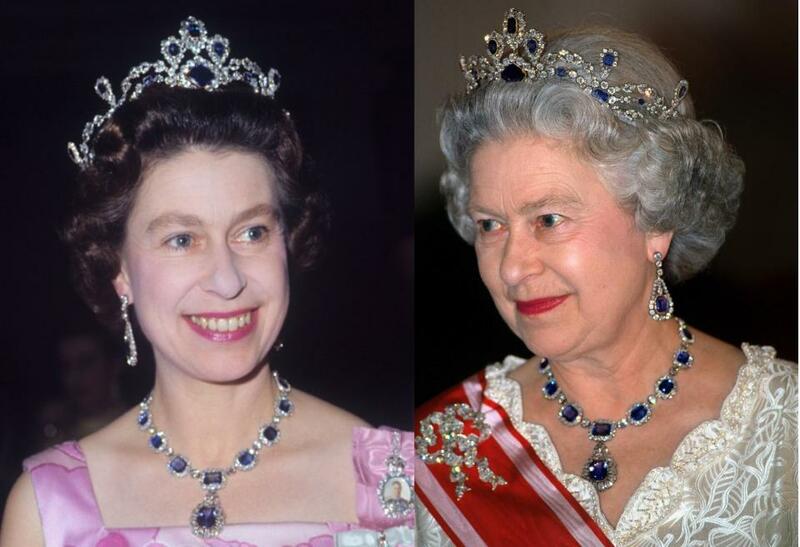 The British Crown Jewels may possess some of the most incredible pieces of sapphire jewelry ever made next to some of Queen Elizabeth II’s personal collection. Formal portrait of Queen Elizabeth II from 1959. The history of empires and sapphires are intertwined, and the British Empire is no exception. The term “crown jewels” refers to a number of crowns, scepters, orbs, swords, rings, and other regalia worn by a sovereign during various state functions, including the coronation ceremony. 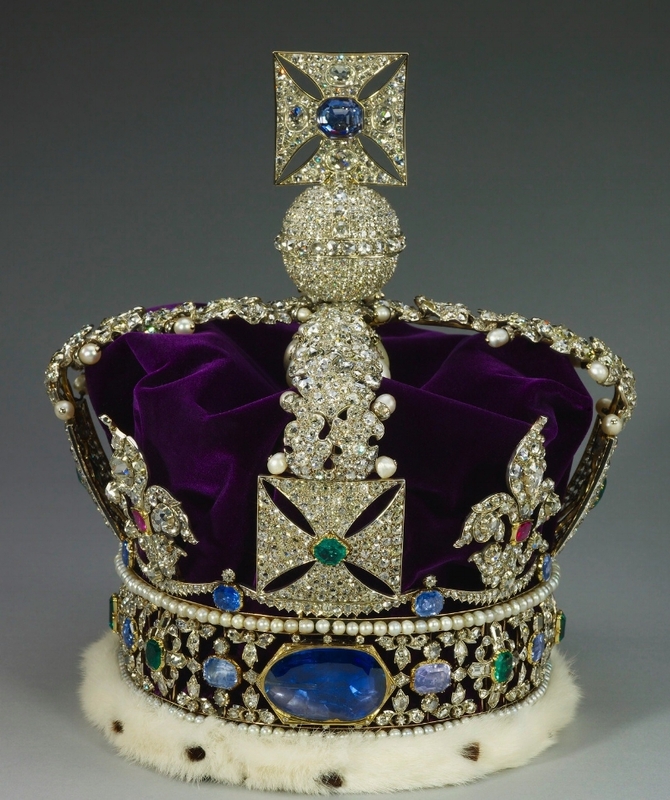 Current estimates place the value of the British Crown Jewels between $4 to $6 billion. Today, the British Crown Jewels are kept in the Tower of London and represent over 800 years of the history of the British monarchy. The Imperial State Crown is one of the most famous of the items housed there. It has a base of four crosses alternating with four fleurs-de-lis, above which are four half-arches surmounted by a cross. Artistic drawings of the George VI Victorian Suite. It is encrusted with gems, and includes several famous jewels such as St. Edward’s Sapphire, a sapphire taken from the ring of Edward the Confessor, and the 104-carat Stuart Sapphire. 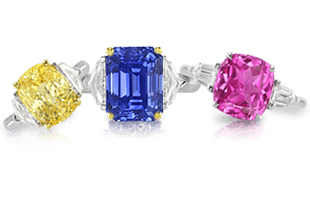 Aside from the Crown Jewels, members of the royal family have developed valuable personal jewelry collections, and they are known for their fondness for sapphires. Her Majesty Queen Elizabeth II’s personal collection is kept in a large vault beneath Buckingham Palace. Among her most cherished items is the Prince Albert Brooch, a huge sapphire, which was given to Queen Victoria by Prince Albert the day before their wedding. A more candid picture of the young Queen Elizabeth. 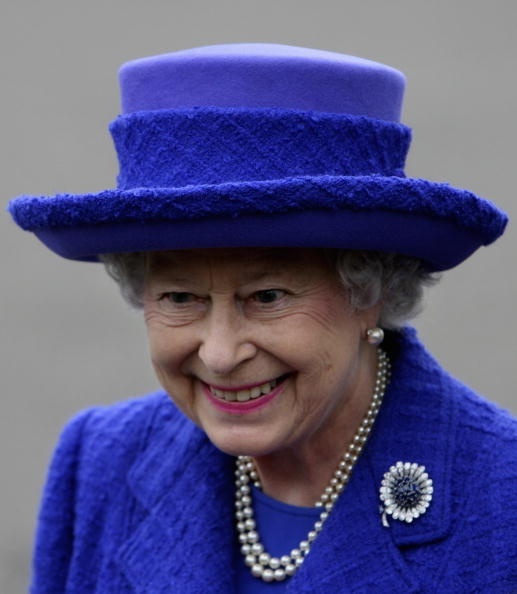 Aside from the Crown Jewels of the United Kingdom, the royal family has amassed a jewelry collection, which is notably heavy on sapphires, a royal favorite.The jewels in the Queen’s collection do not belong to the state but are the personal property of Elizabeth II. Many of the jewels in the Queen’s collection were inherited from her ancestors. 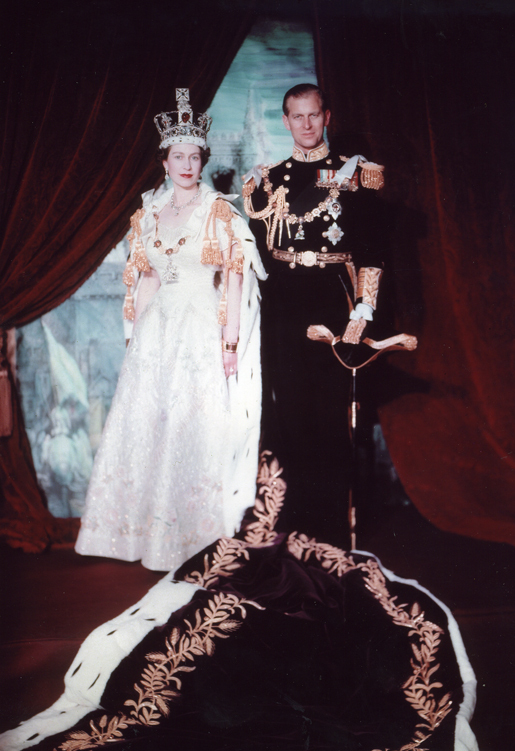 The official coronation portrait of Queen Elizabeth and Prince Philip, 1953. 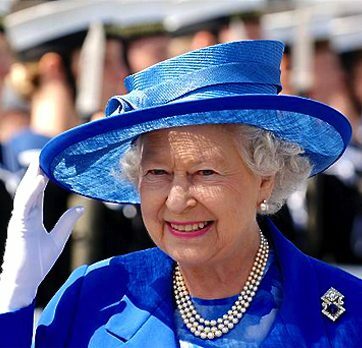 Her Majesty Queen Elizabeth II’s personal collection is valued currently at an estimated $39 million. However, the last large-scale valuation of the royal family’s collection was conducted in 1989 by Mr. Laurence Krashes, senior appraiser for Harry Winston. At the time, Mr. Krashes was not given access to the jewels. Instead, he was made to rely on photos and records to make his assessments, so his valuations are not considered terribly reliable. It is also difficult to appraise jewelry with such a special provenance. There is an indeterminate multiplier effect attached to any jewel associated with celebrity. Although every piece in the royal collection is charged with status or prestige, pieces cherished by Princess Diana, for example, might have special value should they, for some reason, come up at auction. 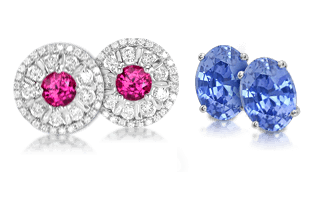 Below, we describe a few of the standout sapphire baubles that are found in the Queen’s collection. Portraits of Elizabeth wearing the George VI Victorian Suite of sapphire jewelry. The George VI Victorian Suite was originally given as a present from George VI to his daughter Princess Elizabeth in 1947. The suite, which was originally made in 1850, is comprised of a long necklace of oblong sapphires and a pair of square sapphire earrings. 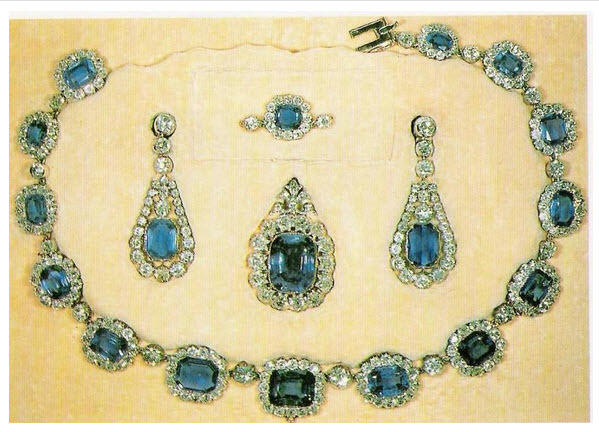 In 1952, Elizabeth had the largest sapphire of the necklace removed in order to shorten the necklace. The gemstone was incorporated into a new pendant in 1959. In 1963, the suite was enhanced by the addition of a new sapphire tiara and bracelet, which were made to match the original pieces. In 1969, Queen Elizabeth wore the complete parure when she and the Duke of Edinburgh attended a charity concert. Queen Elizabeth wearing one of the favored brooch, the Prince Albert Brooch. The Prince Albert sapphire brooch was given by Prince Albert of Saxe-Coburg-Gotha to Queen Victoria the day before their wedding in 1840. 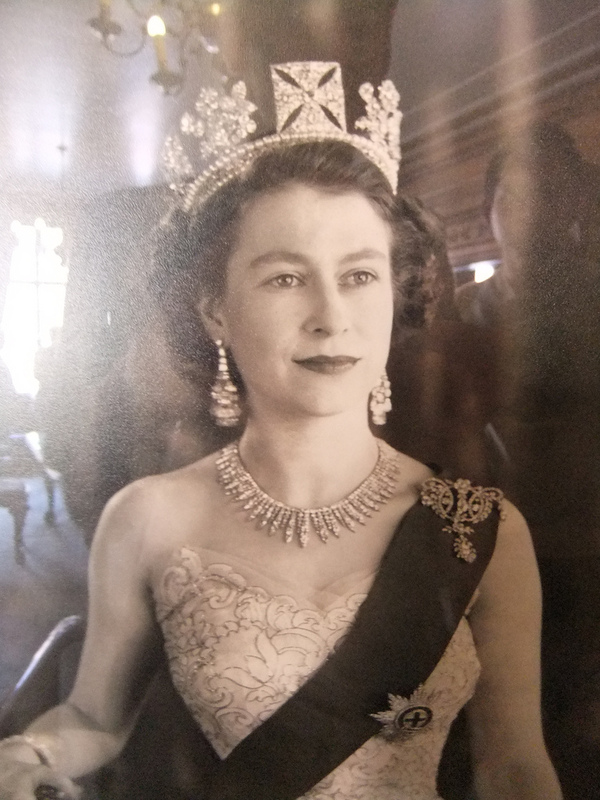 Obviously touched, the Queen wrote in her diary that Albert came to her sitting room and presented her with a beautiful sapphire and diamond brooch. The centerpiece of this brooch is a large luminous blue sapphire estimated to be around 20-30 carats, which is surrounded by twelve diamonds. Queen Elizabeth inherited the brooch in 1952 when she ascended the throne. Queen Elizabeth wearing Marie’s pearl drop sapphire brooch. The Empress Marie Feodorovna of Russia’s Brooch consists of a large cabochon sapphire, which is surrounded by two rows of diamonds. A large pearl drop hangs suspended from the base of the jewel. The brooch was a gift to Princess Dagmar of Denmark from her sister and brother-in-law, the Prince and Princess of Wales, on the occasion of her marriage to Tsar Alexander in 1866. Queen Mary purchased the brooch from the Dowager Empress Marie’s estate in 1929, and Queen Elizabeth inherited the jewel in 1953. Queen Elizabeth wearing Queen Marys Russian Brooch. Queen Mary’s Russian brooch has a large square-cut diamond and square cabochon sapphire set in a scroll frame of round diamonds. Because it is such an unusual piece, it has been worn both vertically and horizontally by different members of the royal family. It was originally given by Empress Marie Feodorovna of Russia to Princess May of Teck (later Queen Mary) in 1893. 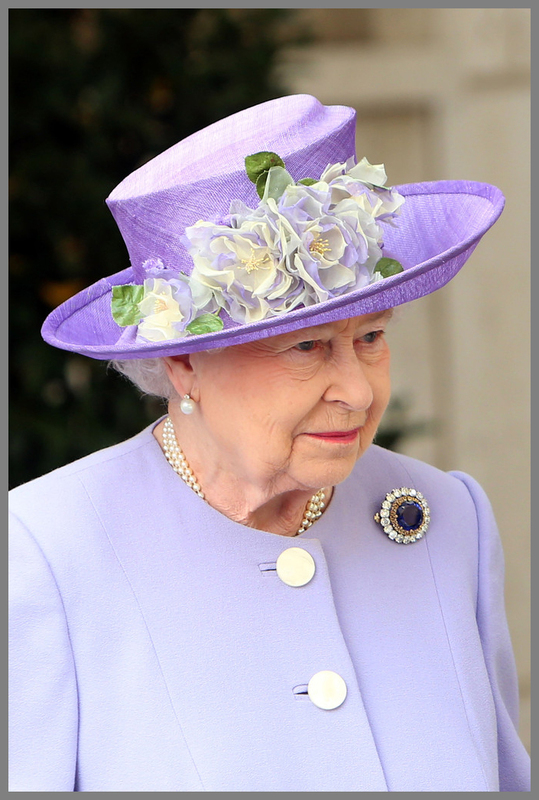 Queen Elizabeth wearing the chrysanthemum sapphire brooch. 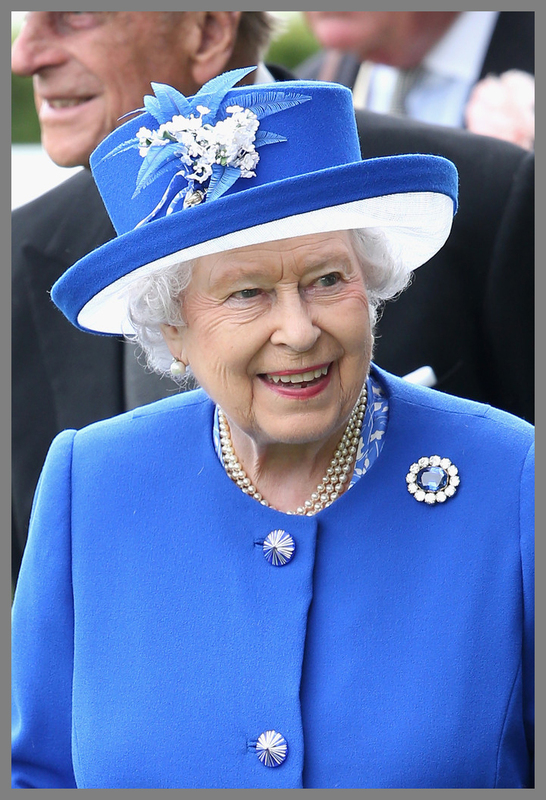 The sapphire chrysanthemum brooch is one of the first gifts the Queen received when she was a princess. Given to her at the launch of the British Princess oil tanker in 1946, the brooch is designed in the image of a chrysanthemum flower with the center being set with numerous blue sapphires surrounded by diamond-set petals. This brooch made many appearances early in the princess’s life including Princess Anne’s christening and for a honeymoon portrait with Prince Philip. When the honeymoon portrait was recreated for the 60th wedding anniversary of the Queen and the Duke of Edinburgh, the brooch made a special appearance once again. 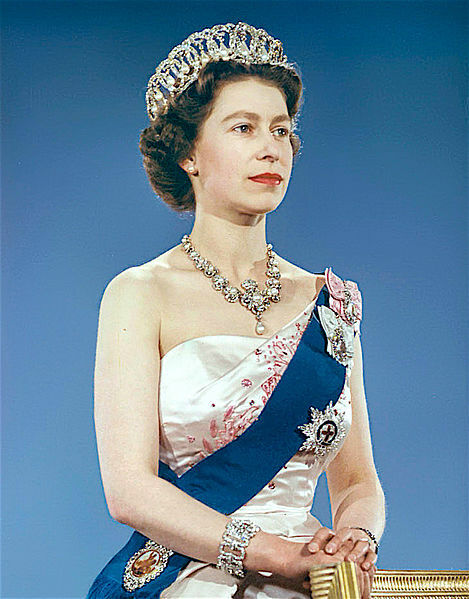 Queen Elizabeth wearing the Russian sapphire cluster brooch. Another piece that was acquired from Empress Marie Feodorovna’s collection by Queen Mary in 1934, this brooch features a large central sapphire stone surrounded by two rings of diamonds. The innermost ring is set in gold with smaller diamonds, with the outermost showcasing 18 large, round diamonds. When Queen Mary passed away in 1953, this brooch passed to Queen Elizabeth, but it was Queen Elizabeth the Queen Mother who wore the piece until her death in 2002. Queen Elizabeth has been spotted wearing this brooch many times since she debuted it in 2014. 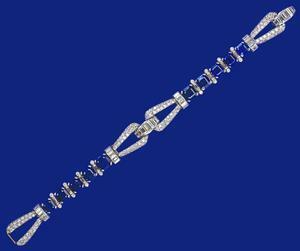 The sapphire and diamond bracelet gifted to Elizabeth for her 18th birthday. The Queen’s father, King George VI, had a real fondness for sapphires, often being a featured gemstone in gifts he gave his wife and daughters. One notable early piece in Elizabeth’s collection came with a sapphire and diamond bracelet in 1944 for her 18th birthday. The bracelet is made of square sapphires separated by diamond links and interspersed with diamond loops, designed by Cartier. The Queen famously wore this bracelet at the Christening of Princess Anne in 1950. 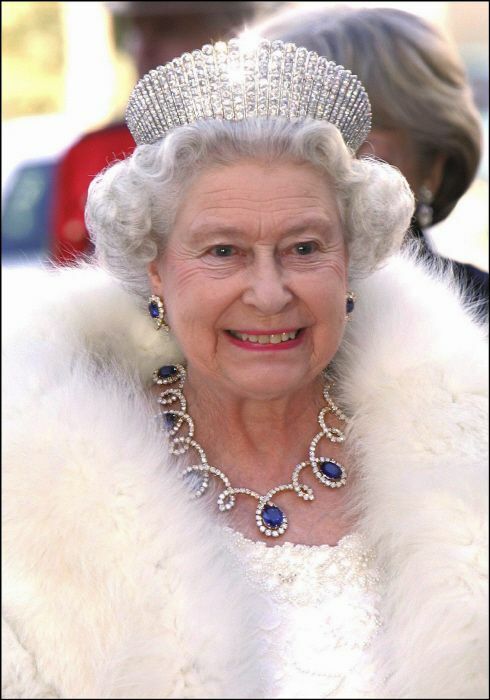 Queen Elizabeth wearing pieces of the Dubai Looped Sapphire Parure. During a visit to Dubai during a Middle East tour in 1979, Sheikh Rashid of Dubai presented the Queen with a necklace of diamond-set loops surrounding large oval sapphires, plus a pair of earrings and a ring with a similar looped design. The Queen was taken with the gift but chose to modify it as she has done with many pieces. She shortened the length of the necklace, removing two sapphires to make new earrings, turning the original earrings and ring into a matching bracelet. She has worn this set on many outings and chose to wear this set for an official portrait for Canada. The Stuart Sapphire as it has been set in Queen Victorias State Crown. 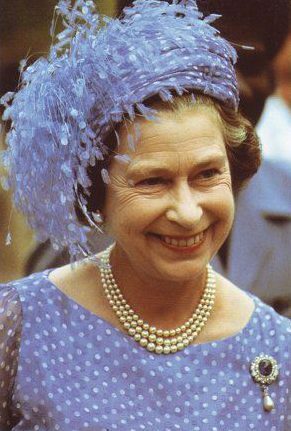 Worn by the Queen at each State Opening of Parliament, the Imperial State Crown contains two of the world’s most legendary blue sapphires. At the back of the impressive crown is the extraordinary oval-shaped 104 carat Stuart Sapphire. At the top, stationed within a cross pattee, is the octagonal-shaped rose-cut St. Edward’s Sapphire. In a crown that also features numerous diamonds, rubies, emeralds, pearls, and other sapphires, these two world famous sapphires still manage to stand out as spectacular gemstones. The newest addition to the Queens brooch collection, the Canadian snowflake sapphire brooch. Perhaps the most recent addition to the Queen’s collection was received as a gift in Canada marking the 150th anniversary of Canada’s confederation as well as the Queen’s Sapphire Jubilee in 2017. 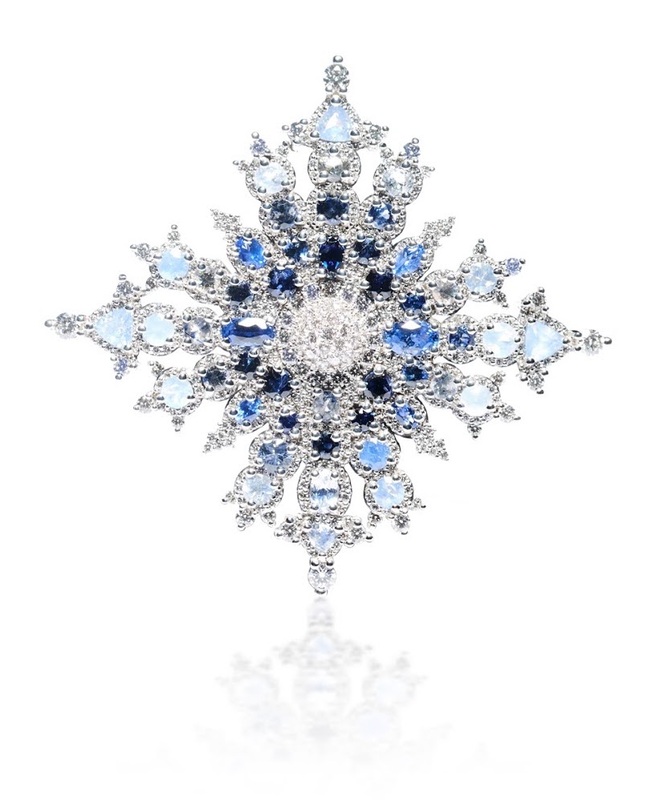 The brooch is designed as a snowflake shaped like the North Star with 48 sapphires of varying sizes, shapes, and hues of blue. The sapphires are darkest in the middle, getting lighter as they reach the edge, all surrounded by diamonds and set in white gold. All materials for the brooch are native to Canada including the sapphires that came from the only known deposit of sapphires in Canada on Baffin Island. The sapphires mined there are called Beluga sapphires, with a variety of naturally stunning blue hues. 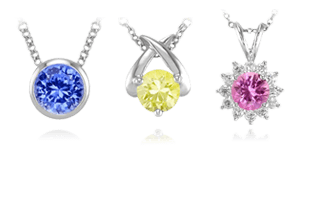 Clearly adored by British royalty and Queen Elizabeth, the allure of sapphires is felt across Europe. 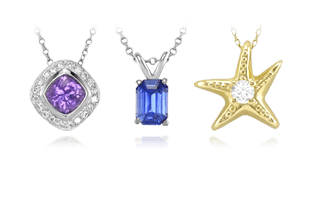 We’ll explore those pieces next in European Royal Sapphires | A Love Affair with Sapphire Jewelry.